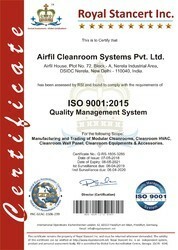 Airfil Cleanroom Systems Pvt. Ltd. is one of the leading Manufacturer, Exporter, Trading and Supplier of cleanroom turnkey projects based out in Delhi. We have set our smallest foot with cleanroom equipment division in the year 2003 by working out from a makeshift factory in New Delhi catering to client requests, since then we have been growing strong. Today Airfil continues its journey through PAN India, and have also served some of the neighboring countries like Ukraine, Nepal, Bhutan, Sri Lanka since then the list is growing. Airfil has earned a huge reputation for weaving innovative ideas encompassing the entire cleanroom product under a single roof. 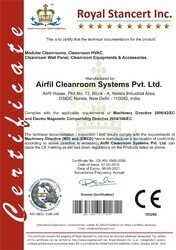 Today, due to the constant hard work and meticulous efforts of the employees and management, Airfil has emerged as a strong name in the industrial domain of Cleanrooms, Cleanroom Equipment manufacturing, Modular OT etc. Airfil additionally with manufacturing capabilities can provide replacement and upgrade for all type of cleanroom equipments required for all level of HVAC projects. Airfil engineers and field service technicians are factories trained in all aspects of quality control, validation and certification for all types cleanroom products. Our depth of experience ensures a quick and economical solution to all your contamination control requirements. Airfil for the past 12 years has achieved a lead position and commissioned more than 25 cleanroom project and served more than 60 reputed organizations. Is to be a global leader In cleanroom technology with complete service to achieve client satisfaction, containment and controlled environment equipment solutions for the scientific, biomedical, pharmaceutical and cleanroom markets. Deliver "zero-defect" quality, innovative, practical products at competitive prices offering the best value. To be integrated player in cleanroom industry offering world-class products and services so as to be among the leading global suppliers of turnkey cleanroom solutions. To build a long-term mutually beneficial relationship with our clients and partners worldwide. We have the support of expert’s team, which comprises dexterous and hard-working professionals. Our team is familiar with the most contemporary advancements and technologies. These experts work in close harmonization with the clientele in order to know their precise necessitates and needs. Our team comprises of quality analyst, administrative personnel, skilled & semi-skilled employee, warehouse professionals, and marketing personnel. At Airfil quality and customer satisfaction go hand-in-hand, we give utmost importance to the quality of products and services we offer. Our operational and quality business plan is designed around the elements of the ISO 9001 - 2015, CE standard. We ensure to conduct quality check during production and before dispatch; also we conduct final quality check after installation at the client site. We continuously invest in our facilities to ensure that we remain at the forefront of technology and improve the process that impacts the quality we deliver to our clients. We conduct training for our client's team to make sure the level of commitment towards quality service from our partners are in sync with the company's fundamentals. Airfil posses years of hard-earned experience in the cleanroom industry, skilled in international turnkey design and execution of projects. implement GMP standards in our product manufacturing process. Provide dual advantage of international design and local production facility. also, offer cleanroom certification & validation. Strong brand goodwill with over 1100 customer and end users. IN-house assembly, manufacturing, R&D and product design team specialized in cleanroom technology and projects. Customer-centric approach working towards a goal of customer comes fast.